Apparently the kids have been wearing him out a bit. 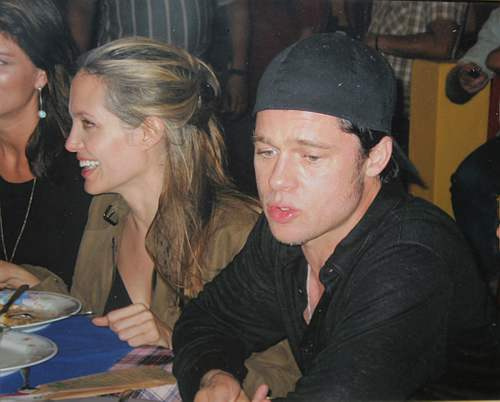 I know that Angie had her hair streaked for a role, but I notice her more than Brad. He just looks tired. Angie looks kinda 'common' with the hair (I guess they needed to tone down her Goddess looks). In other pictures from this group, she looks kind of like Sheryl Crowe. No way. Angelina is beautiful. SC is average. They look so happy in love. Brangelina are a hot couple. Angelina is gorgeous preggers. I love the blonde highlights. These guys rock. RUMOR HAS IT, JEN IS VERY UPSET OVER THIS. GOOD FOR HER. GO BRANGELINA.